A UK hard back 3. 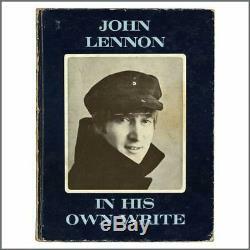 Edition copy of John Lennons book In His Own Write that has been autographed on the inside page by The Beatles in blue ballpoint pen. John Lennon, Paul McCartney and Ringo Starr have signed in black ballpoint pen, George Harrison has signed in blue ballpoint pen. Paul McCartney has added the inscription To Sandra lots of love to the right of his signature. The autographs were obtained by a competition winner that attended Paul McCartneys 22. Birthday party at the Sheraton Hotel, Sydney, Australia on 18. The signatures come with a letter from the original recipient that reads The Beatles came to my home town, Sydney, in 1964. I was one of seventeen girl who won an invitation to Paul McCartneys birthday, in a competition by the Mirror newspaper. I took along my copy of John Lennons book In His Own Write, and it was signed by John, Paul, George and Ringo. The book measures 13.75cm x 17.75cm (5.4 inches x 7 inches). There is some slight damage to the spine. The condition is very good. Near mint = Almost like new with one or two very minor flaws. Excellent = Minor wear yet looks attractive and is perfectly usable. Very Good = Some wear and tear but overall presentable and usable. Good = Apparent wear and tear but with obvious deterioration of the condition. A plus or minus after the grading indicates that the condition is marginally higher or lower than the stated grade. 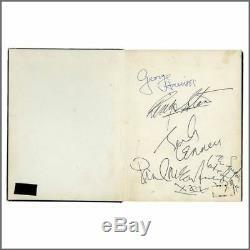 The item "The Beatles 1964 Autographed John Lennon In His Own Write Sydney (Australia)" is in sale since Thursday, January 31, 2019. This item is in the category "Music\Music Memorabilia\Artists/ Groups\Rolling Stones". The seller is "tracksuk" and is located in Chorley. This item can be shipped worldwide.